It’s almost Spring here in the UK, a little bit of wishful thinking never hurt anyone. I’ve never been a big panna cotta lover. Maybe too many have been too hard. If I wanted to eat cold hard cream, I can’t usually see past ice cream. I came across this recipe for the panna cotta from Dan Moon at Ston Easton Park, the ratio of gelatine to liquid was perfect. Making a truly moreish dessert. I’ve added the raspberry sorbet. The recipe I use now is slightly different to normal sorbets. It again includes a little gelatine which creates a superb smooth texture. If you’ve not tried this before you’ll never go back to normal once you do. For the panna cotta, combine all the ingredients except the gelatine. Warm until all the sugar is melted. Squeeze excess water from the gelatine and add to the cream mix. Spread this out on a baking tray lined with cling film. You are looking for a large area about 10-15mm thick. Set aside in the fridge to set. For the sorbet, puree the berries. Add the glucose, sugar and lemon juice. Again warm a little and add the gelatine. Place in to the ice cream machine or alternatively place in some tupperware in the freezer. Mix with a fork every hour until set. For the honeycomb. Have a large sheet of baking parchment set on a worktop. Add the golden syrup to the sugar and heat until it all begins to caramelise. Take off the heat and throw in the bicarb. Stir constantly and pour out onto the prepared baking paper. Spread as evenly as you can an let cool for a few minutes. While still warm but not burning. Cut the honeycomb into squares. When ready to serve, cut the panna cotta into squares the same size as the honeycomb and assemble as shown. This dessert is simply beautiful! I didn’t really like cream for several years, so pannacotta was something that just had the chance to charm me a few years ago – and didn’t it do it! 🙂 My mother makes it with half milk and half cream, which makes it lighter in texture and flavour than the most traditional recipe, but I’ve never tried it with buttermilk – sounds like a really nice idea! Plus the amount of gelatine looks like just about the minimum possible, I guess it had a really nice creamy texture in the end. Regarding the sorbet, I can’t wait to move and get a proper freezer to try making it – I really liked the idea of the gelatine in it! Thanks Ines. It was pleasantly delightful. Keep the ratio the same and use whatever cream/milk combo you like. 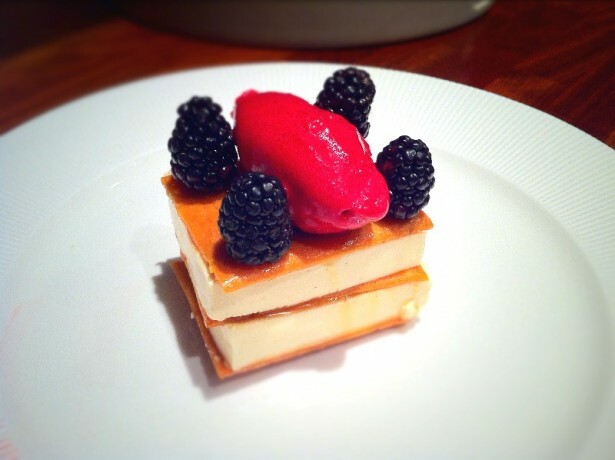 I’ve never made panna cotta…I say I will, but havent yet. You are also correct about hard ones. This does look wonderful..as usual. Love the splash of colour with the sorbet, perfect complement with the rich creamy panna cotta. The desert sound divinely delicious!!! Fabulous idea. You come up with the prettiest desserts David, actually all you dishes are beautifully presented. I really enjoy panna cotta and your version sounds great. Half of the eating is in the way it looks. I’m still learning on that front though. I love panna cotta and I’ve always been a purist but gosh this looks good. Oh, this is stunning! Not that I should be surprised — your plating and flavor combinations are always impeccable. Love the beautiful combination of flavors and textures here – perfection!